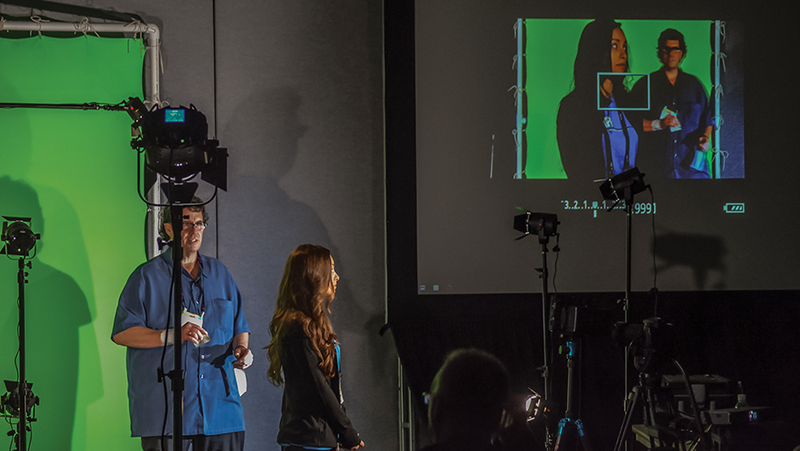 The most important aspect of shooting any type of green or blue screen project is the appropriate lighting. If the subject isn’t lit correctly or the green screen is too dark, too bright, or uneven, chances are you’ll have problems pulling a good matte. I will share with you several methods for proper lighting in various conditions—provided you’ve done your homework in determining how you need your subject to look in the final composite. 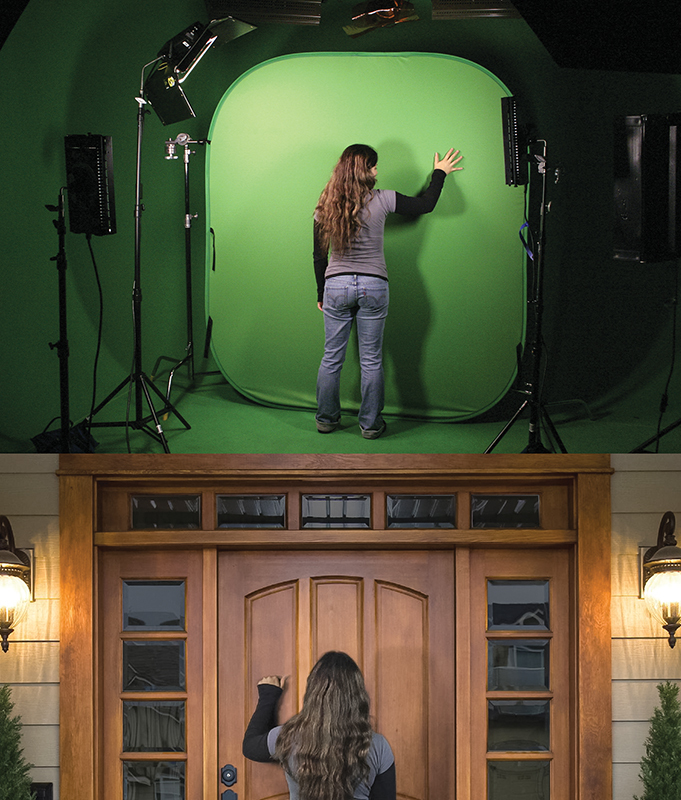 Whether you’re shooting a small portable green screen or a larger screen in a studio, the concepts are still the same and only the scale of the light and distance is adjusted for each setup. There are as many creative ways to light a green/blue screen background as there are camera angles and scenarios. But you must follow a few basic rules for favorable results, no matter how big or small your project. You can also use several types of lighting systems, in different combinations, as well as shoot against a screen backdrop outdoors. You first need to understand the various setups required for the kind of keying you’re going to do. For example, if you’re doing a straight head shot or upper-torso shot, then you don’t need to worry about covering and lighting the floor in your green screen studio. If your actor will come in contact with the green background, then you need to approach the lighting entirely differently. The green background must be evenly lit, otherwise the shadowed areas will be harder to key out. This is especially true for backgrounds behind fine hair or transparent items such as glass or liquids. 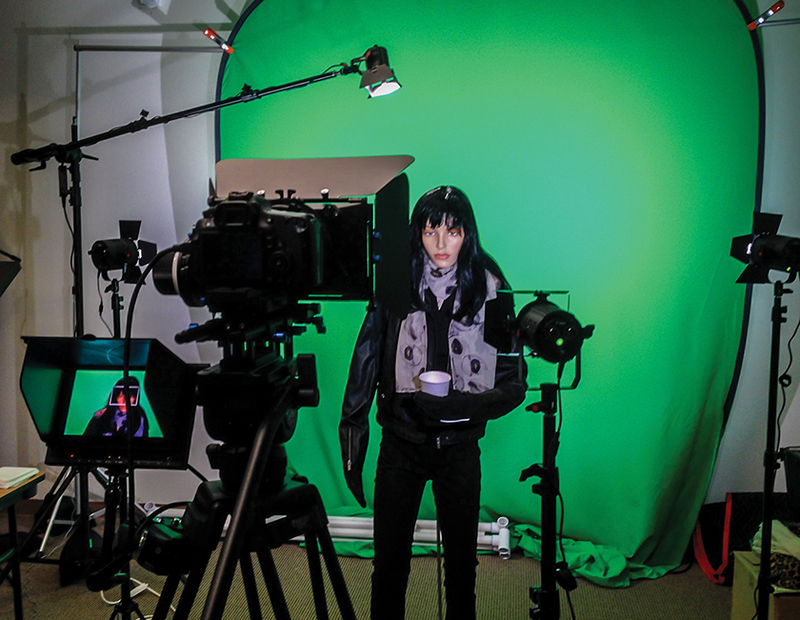 The subject you’re keying out needs to be far away from the green screen so you don’t get spill from the reflective light off the screen onto your subject. In addition, the subject in the foreground must be lit separately so you have control over the exposure and direction of the light source(s) you require for your scene. The figure below shows a starting setup for a project when you’re trying to get a clean key with no shadows or interaction with the green screen. Of course, you need to add more lights if you can’t get sufficient coverage on the screen or if you need to create a specific lighting of your subject to match the background onto which you’re compositing. 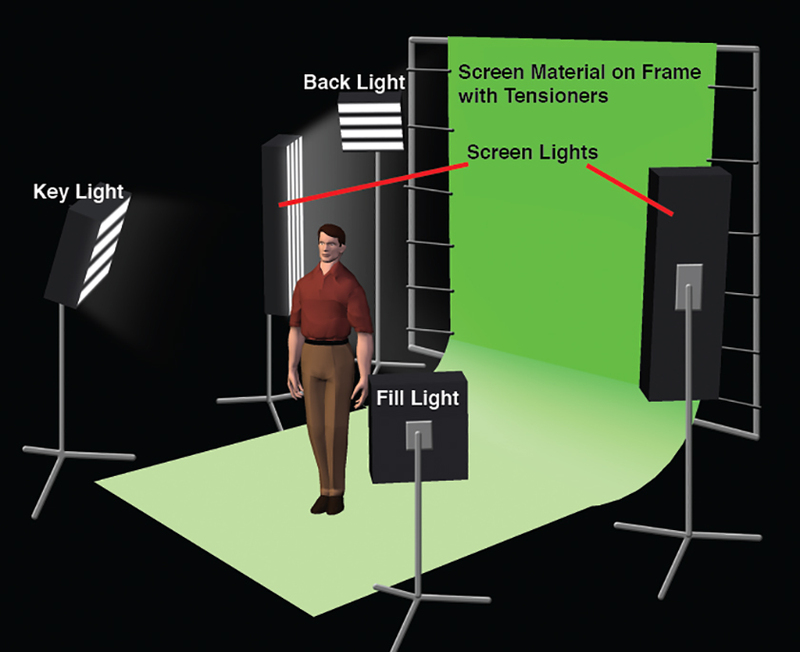 Notice that two larger lights are dedicated to lighting the green screen in this example setup diagram. If you’re using four-bank Kino Flo fluorescent lights (www.kinoflo.com), such as the Diva 400s (or equivalent), you should have enough coverage for a standard 1010 background screen, provided you can move your subject a minimum of 8 feet away from the screen to avoid reflective spill off the brightly lit screen. 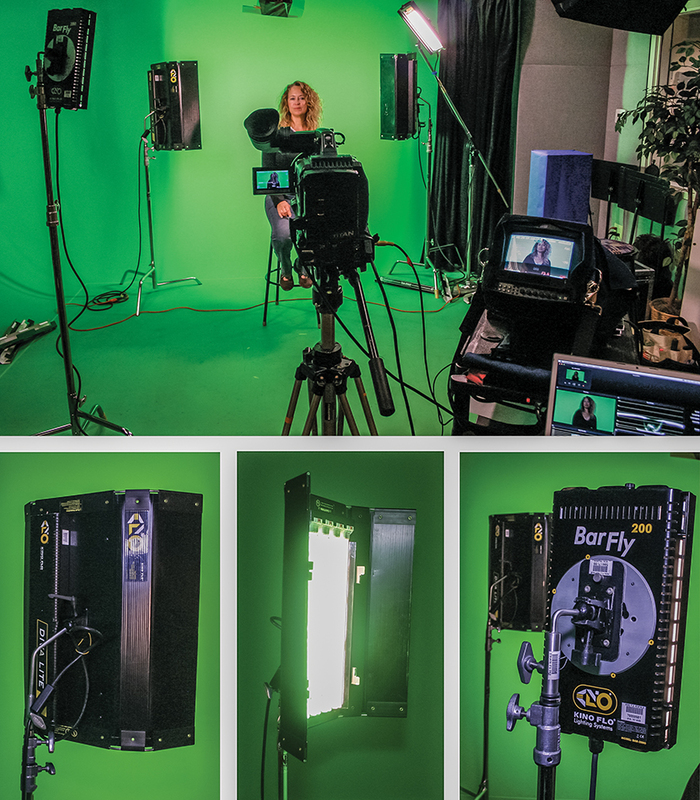 If you’re using smaller tungsten video lights, compact LEDs, or LED Panel lights, you will need to be sure you have enough lights in place to fully cover the green screen evenly. 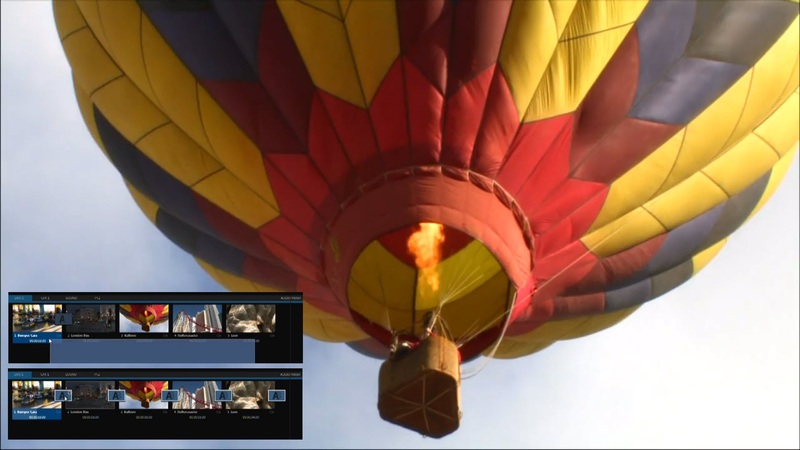 This is a more difficult process as it takes a lot of effort to avoid hot spots and shadowed “drop out” spots where the screen is under exposed. Remember, EVEN lighting is the key! You use model lights to light your subject. This is the same lighting used in still photography or video interviews. The three essential lights are the Key light, the Fill light, and the Back light. If you’re doing simple interviews or a talking-head shot in a studio, the layout of these three lights as shown in the diagram above will probably be sufficient and pleasing to the viewer, because it’s most flattering for your model or subject. The Key light is your main light. This is the predominant light source on your model and should be positioned to match the direction of the strongest light source in the background to which you’re compositing. 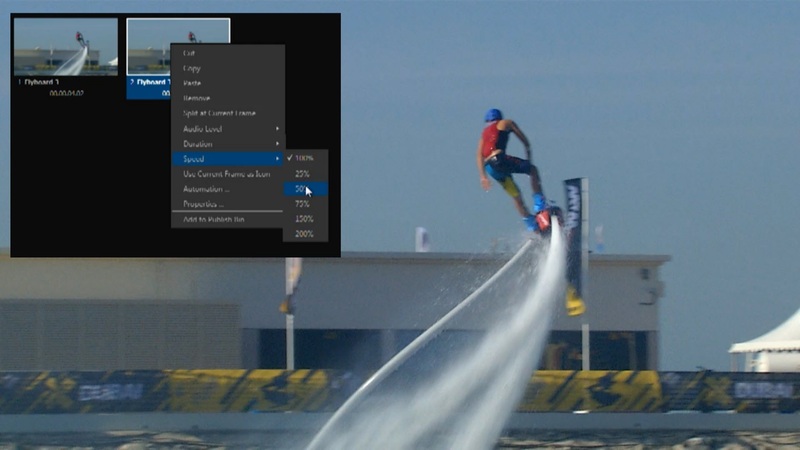 For instance, if your subject will be composited into an outdoor scene with strong sunlight, you need to match your key light to the direction the sun is shining in your background footage. Matching the color temperature and intensity is equally important. If you’re compositing your subject onto a scene that’s supposed to be under a streetlamp on a dark corner, then the same concepts apply, but the direction and intensity of the light source should be much different. The Fill light is just as its name suggests: it fills in light throughout the scene. The position and intensity of this light (or several lights) give the illusion of creating available ambient light in a scene. To use the previous examples, a bright outdoor setting requires much more fill light than a dark scene under a streetlamp. Matching color temperature is equally important in the fill light and can be controlled with colored gels. You may opt for several fill lights, silks, and/or reflectors to achieve the proper lighting of your subject to match the final background plate you’ll be compositing onto. The Back light is mostly used for studio settings; it creates a soft halo effect on the subject’s hair. This gives a bit more definition from the background but isn’t necessarily good for compositing into a background scene where you need to match lighting. In that case, you should have several fill lights to help provide even lighting. In any case, be sure your subject is far enough from the green screen and the screen lights so that you have the most control over your foreground lighting and to avoid spill as much as possible. 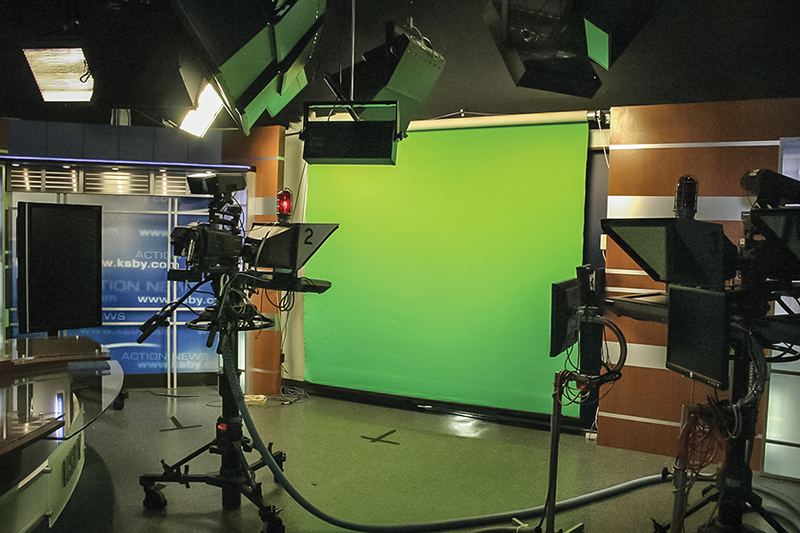 The figures below show a couple of different live green screen setups using both Kino Flo fluorescent lighting and Fiilex Spectral LED lights (www.fiilex.com). Another popular, simple setup uses the model lights to light both the screen and the subject. The subject is close to the screen and the Key light is predominantly strong, causing a shadow on the back wall. To compensate for the reflective spill, side spill-suppressor lights on either side of the subject warm up and wash out the spill, creating a clean key in the studio, as shown in the figure below. 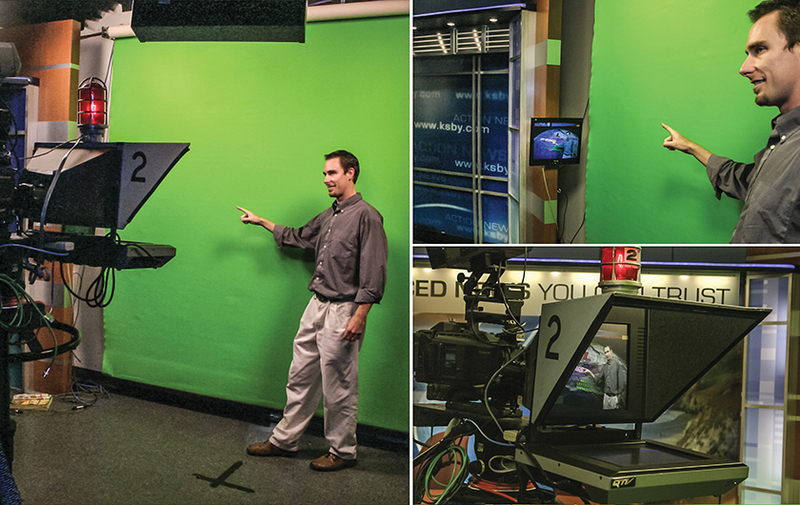 This setup is most popular for the purpose of interacting with the back wall surface, such as live TV weather forecasters who make contact with the screen and want to retain shadows on the wall. Directors may sometimes use a blue screen in this case if they want subtle shadows and aren’t worried about reflective spill. Note that your lighting may not be as even in this setup, because you use the available model lights to illuminate both the background and the foreground elements. The side spill lights not only help reduce spill on the subject, but can also help even the illumination of the screen if positioned properly. 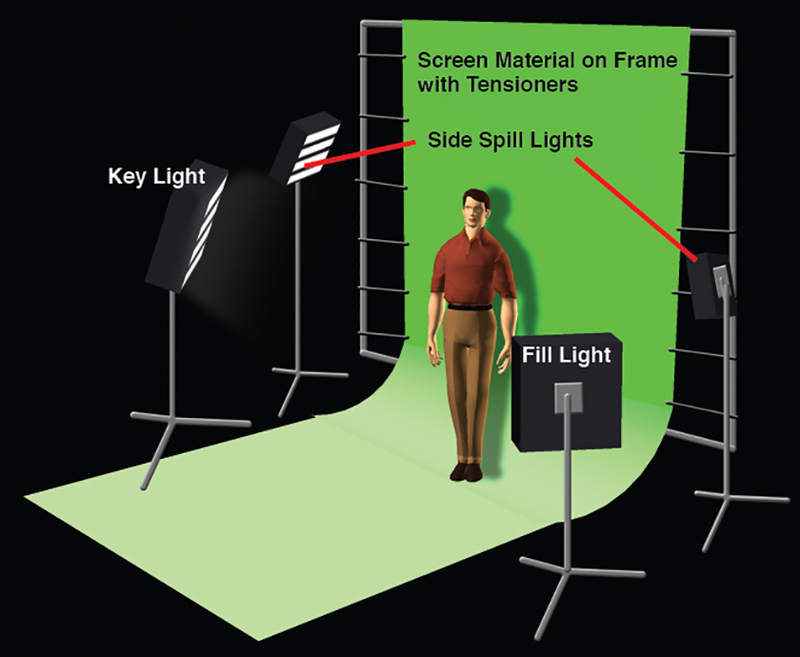 Often times, this gets confusing to someone shooting green screen for the first time, and they omit the side spill lights or just over-light the Key and Fill lights in an attempt to light the green screen. I see this all the time and that’s when folks start having a lot of issues trying to get a good composite.